Enbridge is proposing the Line 3 replacement pipeline, its biggest pipeline project ever, which will pump Tar Sands crude oil over a thousand miles through Canada and into the US. The pipeline will cut 337 miles through Minnesota, where it still needs state approval. Line 3 is facing intense opposition from environmentalists, landowners, native communities, and even the Minnesota Department of Commerce. It’s no wonder, then, that pro-Line 3 corporate forces are trying to manufacture public support for the pipeline. And they’re doing it by resorting to a common tactic used by the fossil fuel industry: financing and influencing a “study” that touts the economic impact that a pipeline will produce. These studies are influenced by the very interests who will profit off of the pipelines, but pro-pipeline forces are able to parade them as truth to the public, who often don’t know about the conflicts and biases behind the rosy-sounding numbers they hear. UMD Study… or Enbridge PR? Fossil fuel interests typically hire private consulting firms to produce these studies, but, as we show in our new report, Enbridge-backed groups paid the University of Minnesota Duluth to churn out a flawed study that pipeline backers are touting in the media and public hearings. An Enbridge consulting firm and an Enbridge-backed business group paid UMD over $15,000 to produce the study. None of this was disclosed in the study. UMD is a dues-paying “core member” of the business group that commissioned the study — its chancellor even sits on its board alongside a representative from Enbridge. The study is unreliable for a few reasons, including that Enbridge provided much of the data inputs, it doesn’t look at potential environmental costs or property value declines, and it’s based on IMPLAN modeling, which is easy to manipulate (indeed, its findings are contradicted by other IMPLAN studies). The Duluth News Tribune finances and directs the group that commissioned the UMD report, but doesn’t disclose this in positive editorials that tout the UMD’s study’s findings. 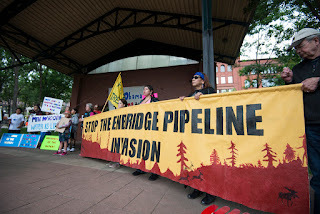 The circumstances behind the Enbridge-backed UMD study, and the ways it has been used by pro-Line 3 corporate forces, raise important concerns regarding public trust, democracy, transparency, and professional ethics. The UMD study is a prime example of a wider tactic used by the fossil fuel industry, which we’ve reported on before, whereby the industry and industry-backed groups fund studies that bear a legitimizing university imprimatur but are in fact deeply influenced and/or supported by the very oil and gas companies that have a vested interest in the results of the studies. The findings of these industry-financed studies are then spread by backers as fact in op-eds, editorials, letters to editors, public hearings, and other mediums, all while being referred to as a given university’s study — with the authority and trust that confers — rather than an industry study. The purpose of public universities like UMD is to serve the public good and engage in public education. They are not intended to serve as promotional vehicles for the fossil fuel industry and its private interests. UMD isn’t the first public university to produce a report financed and promoted by the fossil fuel industry. In fact, there are some interesting past examples of how organizers have held universities accountable that produced these kinds of studies. When the University at Buffalo’s Shale Resources and Society Institute released a May 2012 report that played up the safety of fracking in Pennsylvania and New York, we decided to take a closer look at it. We found that the central claims in the report were false and that the report’s authors and reviewers had strong industry ties, among other problems. Members of the UB and Buffalo community – faculty, students, concerned citizens – took action. They formed a group called the University at Buffalo Coalition for Leading Ethically in Academic Research (UB CLEAR), and they organized a petition to close the Shale Institute that garnered over 10,000 signatures. In November 2012, pressured by faculty and students and embarrassed by damaging news coverage, as well as the SUNY board of trustees, the UB Chancellor had no other choice than to shut down the Shale Institute. Also in 2012, the University of Texas’s Energy Institute released a draft report that claimed “the environmental risks of fracking were minimal” and that fracking wasn’t connected to groundwater contamination. We discovered that the main researcher, Charles “Chip” Groat, was a fossil fuel industry insider who sat on the board of a fracking company. Groat didn’t disclosed that he had a $1.6 million stake in the company – and therefore a vested interested in the fracking industry. The story was picked up widely in Texas and generated such a significant backlash that Groat and the director of the Energy Institute resigned their positions at UT, and the UT system overhauled its conflict-of-interest rules. We list some recommendations at the end of our report, including that UMD should retract the study with a public statement and form a committee to overhaul its rules surrounding conflicts of interest in research. See all our recommendations here. >> The article above was reprinted from LittleSis.